Der Pressbengel, by Ernst Collin, was originally published in German in 1922. Conceived as a dialogue between a bibliophile and a master bookbinder on all aspects of the bookbinding craft as well as specific techniques, the text also addresses the conflicts between quality and cost and matters of good taste. The family and bindery of W. Collin were Court Bookbinders in Berlin from the mid 1800 until the "liquidation" of the firm under the Nazis. It is this legacy and the work that they produced that is basis of Ernst Collin's work. This 2nd edition features a corrected and expanded biographical introduction by the translator, and discusses the historical context of the decline of formal training, a trend that continues today. This text is laid-out for printing double-sided on 8.5" x 11" paper and binding in workshops and demonstrations related to the history of the book, book arts, and related topics. Please discard the first two sheets after printing. 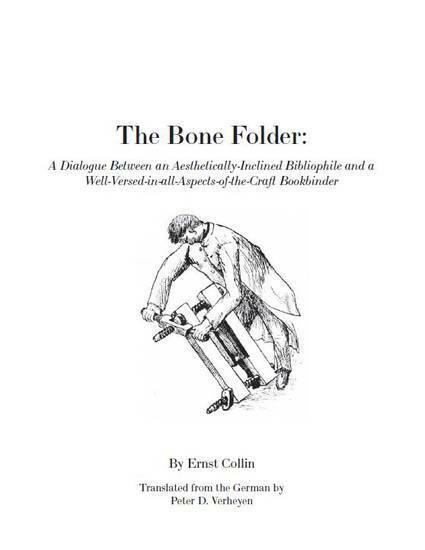 More information on the Collins and German bookbinding during the 19th - 20th centuries can be found on the author's Pressbengel Project Blog. For information and binding ideas contact the publisher and/or order Karen Hanmer's Contemporary Paper Bindings: A guide to bookbinding techniques, tools, and materials that features many structures, including non-adhesive.